You’ve heard the clichés: A draft class can’t be truly judged until three or five years down the road. But guess what? It’s been five years since general manager Rick Spielman selected Anthony Barr and the rest of the Minnesota Vikings’ 2014 draft class, so grades are due. And we’ve got our red pens out. We distributed grades to this class back in 2017 after three full NFL seasons. Scroll down to peek at how the Vikings’ 2014 draft class grades out and how things have changed the past two years. 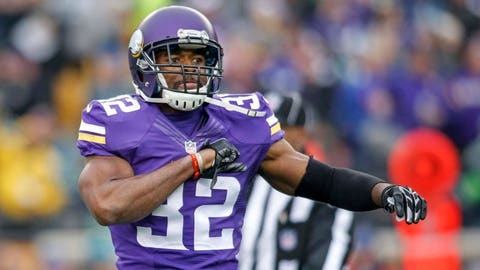 Barr spent his first five seasons with the Vikings before signing with the New York J -- oh wait, he’s back. 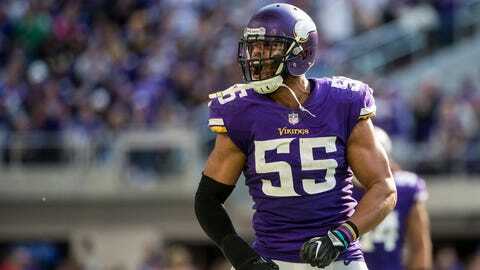 The linebacker flirted in free agency with the Jets before changing his mind and inking a five-year deal worth $67.5 million with Minnesota this offseason. The Vikings are glad he’s returning. 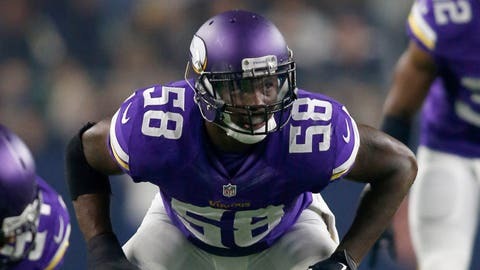 Barr hasn’t produced the gigantic sack numbers he compiled in college (23.5 sacks over his final two seasons), as his NFL career best is four back in 2014, and his play and effort have been criticized at times by head coach Mike Zimmer. But overall, the speedy linebacker who can do it all as an edge rusher, run-stopper and cover almost anyone on the field, is a crucial part of Zimmer’s scheme and does much more than what shows up on the stat sheet. Those four straight Pro Bowl appearances bode well for his case, too. Hey Teddy, hey Teddy! 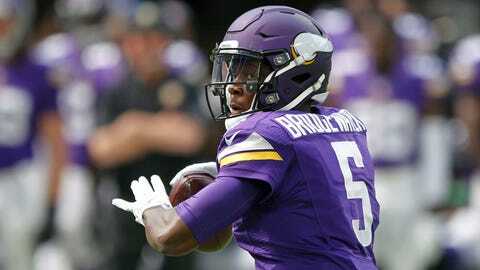 Bridgewater will always be beloved by Minnesota after he easily won over the hearts of Vikings fans during his four-year stint with the organization from 2014-17. In his first two NFL seasons, Bridgewater compiled a 17-11 record, 6,150 passing yards, 28 touchdowns and 22 interceptions in 28 starts. He led the Vikings to an 11-5 record and playoff appearance in 2015, showing legitimate evidence he was ready to be Minnesota’s first true franchise quarterback since Daunte Culpepper. But then, The Injury. Bridgewater’s horrific knee injury in 2016 derailed his promising career. He’s now playing for arch nemesis New Orleans, viewed as Drew Brees’ successor under center for the time being. 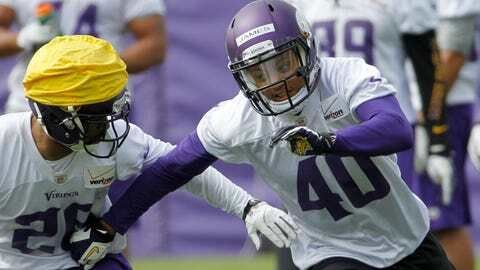 Expectations were high for Crichton when he joined an already loaded Vikings defensive line, which starred Brian Robison and Everson Griffen back in 2014. Crichton, a three-year starter at Oregon State, compiled 23.5 sacks and 51 tackles for loss over his collegiate career. But heading into the draft, his potential was still considered untapped thanks to his freakishly athletic 6-foot-3, 273-pound frame. Crichton never lived up to the hype. 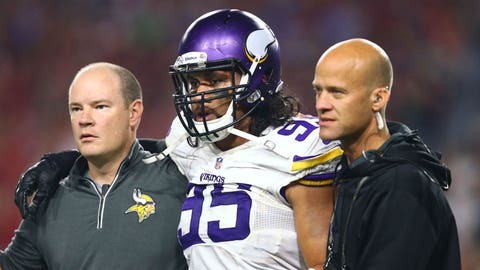 He appeared in 21 games over two seasons for the Vikings before suffering a concussion and landing on injured reserve in 2015. Crichton never appeared in another NFL game, finishing his professional career with exactly zero sacks. McKinnon was the Vikings’ leading rusher in 2016, which sounds great until you remember Minnesota had the NFL’s worst run offense that year (75.3 yards per game). “The Jet” was at his best as a change-of-pace back to Adrian Peterson, adding a pass-catching dynamic to the Vikings’ backfield. 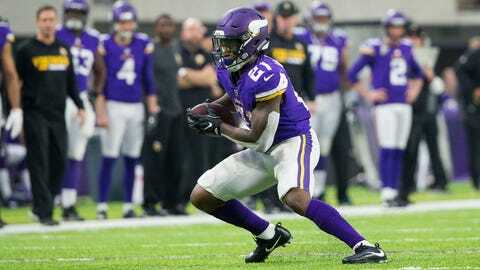 In four years with Minnesota, McKinnon rushed 474 times for 1,918 yards (4.0 yards per carry) and caught 142 passes for 984 yards. He departed for San Francisco in free agency on a rather generous four year, $36.9 million deal last offseason but has yet to appear in a game for the 49ers after a torn ACL suffered in practice held McKinnon off the field in 2018. Yankey, who was the only offensive lineman taken by Minnesota in this draft, never panned out. 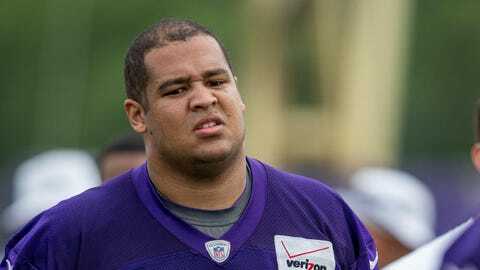 The 6-6, 315-pound offensive guard was supposed to compete for the starting left guard job as a rookie. Instead, Yankey never appeared in a game in 2014 and spent the entire following season on the practice squad. Yankey wound up signing with Carolina in 2016 and played six games for the Panthers, but the NFL hasn’t heard from him since. Exum’s rookie season is 2014 was promising, as he carved out a role as a factor on special teams. And he followed it up by shining in his first two career starts at safety the following season, filling in for an injured Harrison Smith and tallying eight tackles and two fumble recoveries. But Exum suffered a season-ending leg injury in 2016 and another in minicamp the following season, and he never played another game for Minnesota. Now a safety in San Francisco, Exum started seven games last season for the 49ers, logging 50 tackles, one interception and one sack. Exum is by no means a star, but Spielman drafted a productive player in the sixth round, it’s just that another organization is reaping the benefits. James is another name in this draft class that gets a resounding “WHO? !” among even the most diehard of Vikings fans. 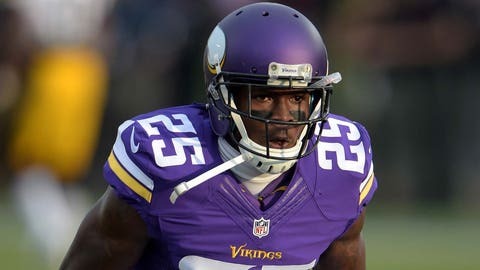 James was signed to the Vikings’ practice squad after 2014 training camp. But just a few days later, the Vikings cut James free of the practice squad, sending him on a journey to three other organizations that year -- Cleveland, Houston and San Diego. James never made a tackle in an NFL game, but was last seen this spring playing for the San Diego Fleet of the Alliance of American Football, may it rest in peace. Stephen has emerged into one of Spielman’s best value picks. 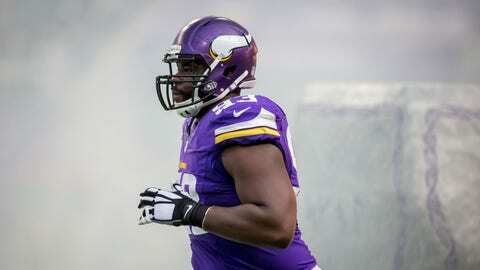 A 6-5, 305-pound defensive tackle out of Connecticut, Stephen found his way into the Vikings rotation in the trenches and started 20 games from 2014-17. Like fellow DT Tom Johnson, Stephen took a one-year hiatus from Minnesota to sign a one-year deal with Seattle last season. Stephen had a solid 2018, racking up 25 tackles and career-best two sacks in 15 games (14 starts). 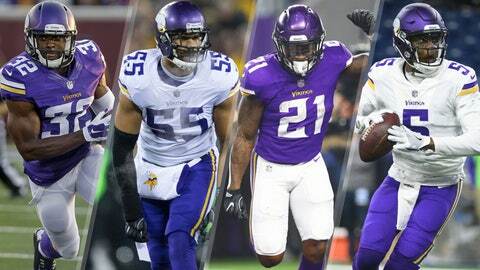 Now back in Minnesota on a three-year deal, Stephen joins Barr as the only two players from the 2014 draft class still with the Vikings. That’s some great value for the 220th overall pick. Spielman took a flier on Watts, a linebacker that posted a 4.40 40-yard dash at Georgia Tech’s pro day before the draft. Watts did enough to make the team in 2014 and 2015, using his speed to make an impact on special teams. With the Vikings’ depth at linebacker, Watts was a part of Minnesota’s final cuts in 2016 and never found an active roster in the NFL. Like James, though, Watts landed in the AAF this season, tallying 15 tackles (three for loss) for the Atlanta Legends. Watts wasn’t Spielman’s best pick in the draft, but he certainly wasn’t the worst. Price played 14 games (47 snaps) for Minnesota in his rookie season and logged 10 tackles, but that’s about it. The North Carolina product began 2015 with a two-game suspension due to a DWI and never appeared a game that season. He suffered a season-ending injury in the final preseason game the following year, spent all of 2016 on injured reserve and was released in 2017.